Real brides who told their love story through their lehengas, saree blouses, mehendi & more! Are you a die-heart-romantic? Did you always want to stand out from the sea of brides who wore the same old gorgeous lehengas and wanted to opt for something that’s more you? How about saying your love story with your wedding lehenga, your engagement saree or even with your mehendi? We say it’s an ah-mazing idea and will make you stand out as a bride too! This is a gorgeous lehenga skirt by Kresha Bajaj, but the highlight of it is the story behind it! When you look closer you will notice something written on the skirt. These are the love poems from the groom to his to-be wife which have been embroidered onto each kali, while roses intertwined with their names go up the lehenga into vines. The hem is finished off with a starry night skyline of their favorite city - New york! Kresha Bajaj, has self designed her wedding lehenga with embroidering her entire journey with her then fiance on it. This bride decided to say she is ‘Sarva ki Dulhaniya’ through her blouse and we say that her design is totally on point! Samantha Ruth Prabhu’s engagement was quite the talk of the town and her saree made headlines by itself. She had the whole border crafted using a combination of zari and zardozi embroidery techniques and personalized to incorporate milestones and special details of her love story! London Eye and London Bridge hold a very special place in Masoom Minawala's heart as that's the place where Shailin (her now-husband), proposed to her, and she incorporated the same in her mehendi! It’s a very popular yet age old tradition of hiding the groom’s name inside the intricate mehendi pattern. 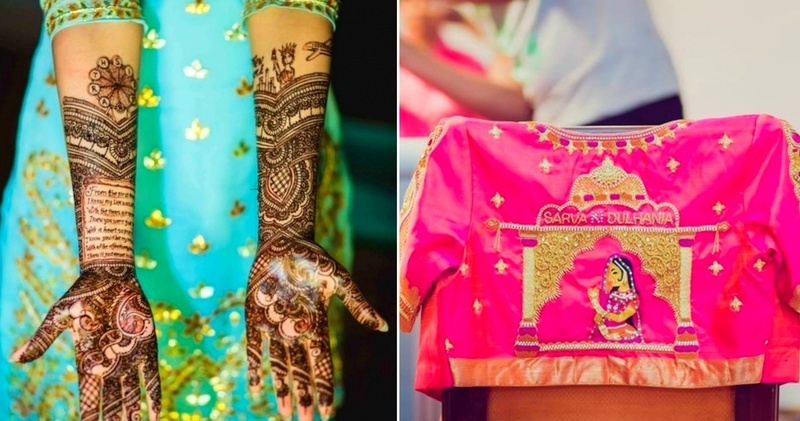 But this bride went a step ahead and included her wedding hashtag in her mehendi design. Are you a couple who bonds over your favourite movies and TV series (we mean who doesn't)? So, this one is for you. Game of Thrones has certainly taught its fans to be wary of weddings, but seems like this couple loved the show a tad too much! Inspired by this popular series, this bride created a whimsical, non-bloody Game of Thrones themed décor for her bridal entry and it was stunning! #WeddingDecorGoals! Now that’s one way to say your story too! What do you think of this bride’s wedding shoes? ….. and this couple seems to be a major Harry Potter fan! So which one is your favorite way to say your love story?